I was on my kayak at Hosmer and had been trailing her at a distance for a time, clicking off photos with my Canon SX50 Ultrazoom. I hoped there might be a hidden treasure in the photos when I viewed them at home. So I just kept snapping pics. The little ducklings stopped at a bank and fluffed their fluffy down feathers, organizing and preening themselves duckily. It was by sheer luck, and much to my amazement, when the mother called to them and organized her little balls of fluff on the log, just for my photos. I was very close in the kayak, making slow, measured movements and holding my breath. After she gestured, they all hopped up. I sat, mesmerized, clicking off pics, and marveled at how perfectly cute they all were. I had taken about 20 photos before moving off and giving them their peace. When I got home, I combined the pics by selecting poses from each and aligning them just so for the painting. A little guy who had stretched out his leg became my focal point. 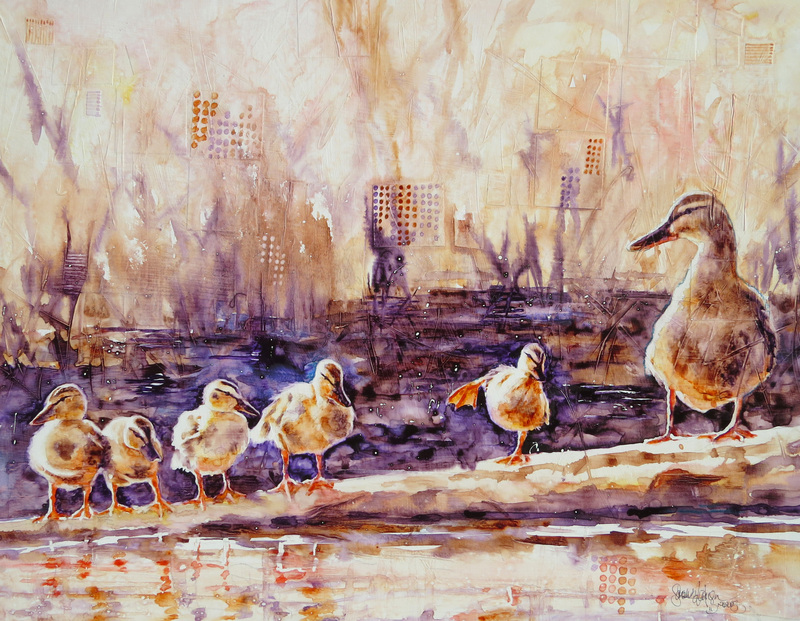 I painted the first wash quickly, deciding to use purple and quinocridone burnt orange as my two main colors, creating a somewhat neutral color palate with a strong horizontal line of dark value behind the ducklings. Since I wanted the small duck with his foot outstretched to be the focal point, I removed a chick to the immediate left to give him a little space. I had used liquid mask on all the areas of their highlighted downy feathers, to keep it sparkling white in the end. I wasn’t sure what I wanted to do with the background yet, other than keeping it loose and letting it fade away. 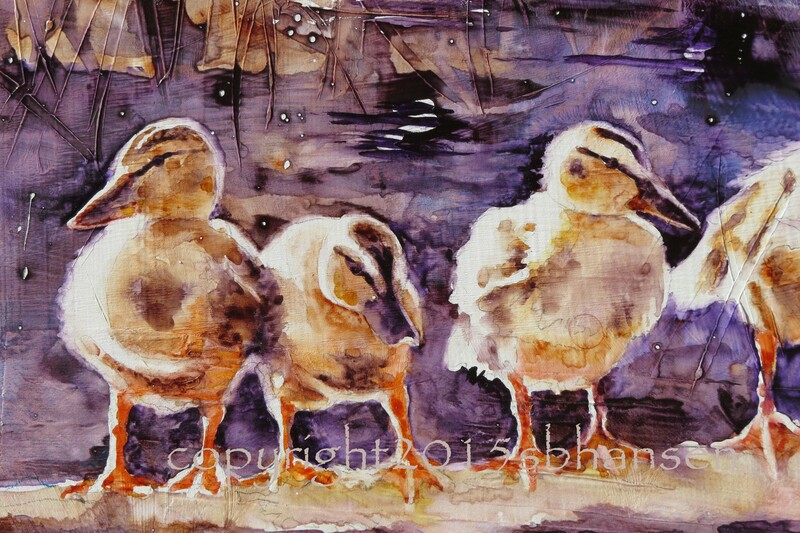 I stepped away from it and allowed it to dry, knowing I would relish adding detail to the little ducklings. While it sat, I ran across an article in a magazine illustrating little dots in the background. I knew it would work for this painting. 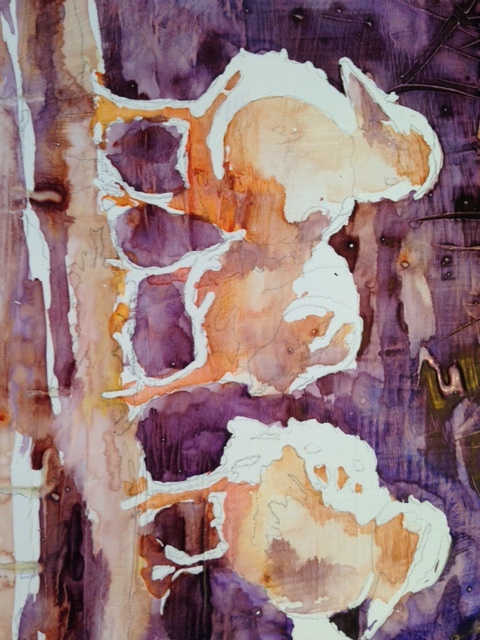 In order to finish it for my First Friday showing at Desperado, I quickly began working on it the morning of the show. Once I had removed the liquid mask, I worked on each little duckling. I paid close attention to detail and softened the edges so that their down appeared fluffy. I concentrated on keeping the downy feathers very soft. 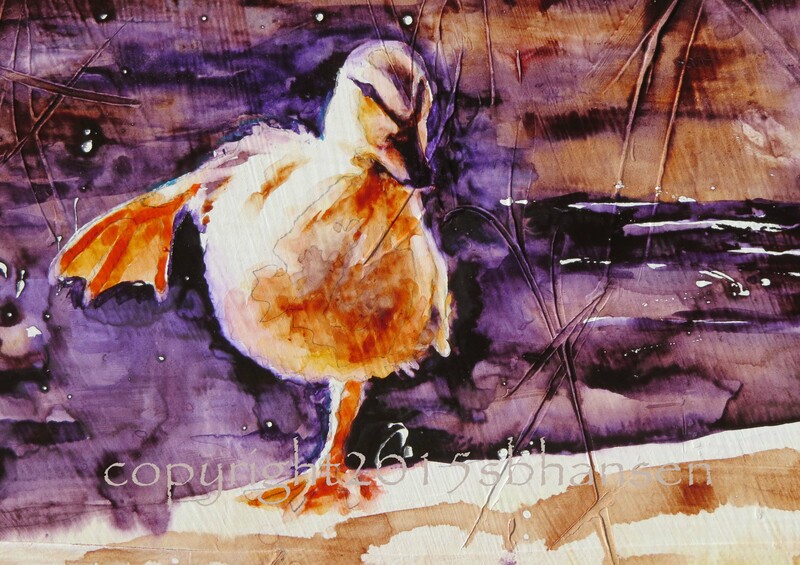 I saved the last little duckling to the end, using intense color and fine detail in his form. I made sure to keep the background as dark as I could behind him and accent his little stretched out foot with a vivid orange hue. The painting has rhythm, which I enhanced by keeping all their legs and feet very bright with an orange and red mixture, their colors about the same, and the top of the log completely white to connect them all together. 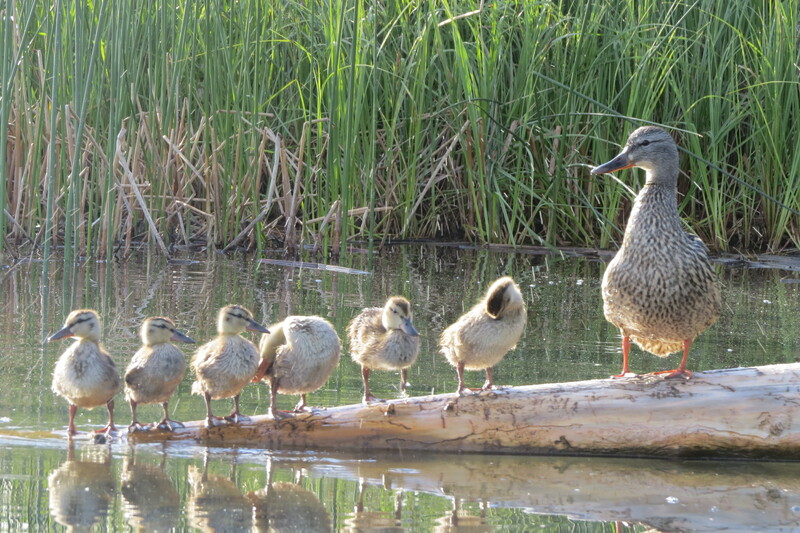 The mother duck looks over at them, bringing our view right back to the small guy with the outstretched foot. After the ducklings and their mother were finished, I addressed the background with the squares of dots I mentioned earlier. 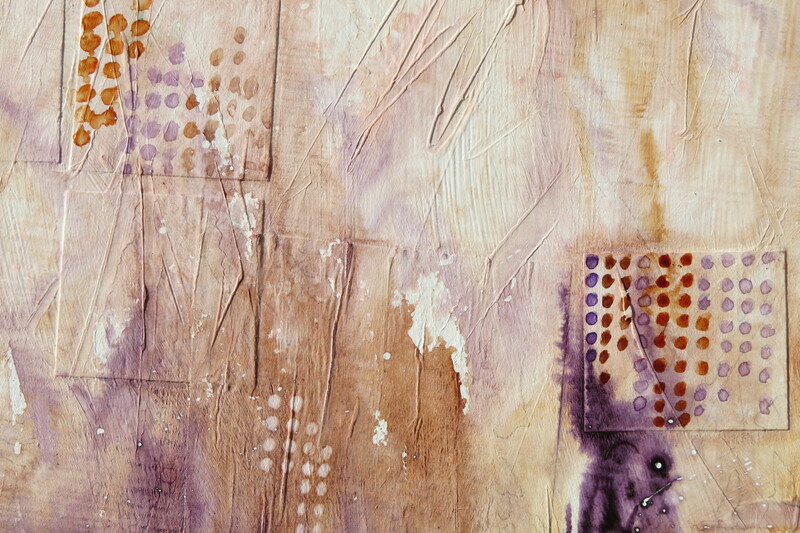 You can see in the photo below how textural this painting is, with the collaged squares of paper and the scribbles of gesso. I love the dot effect, which further illustrates the organization of the little ducklings. 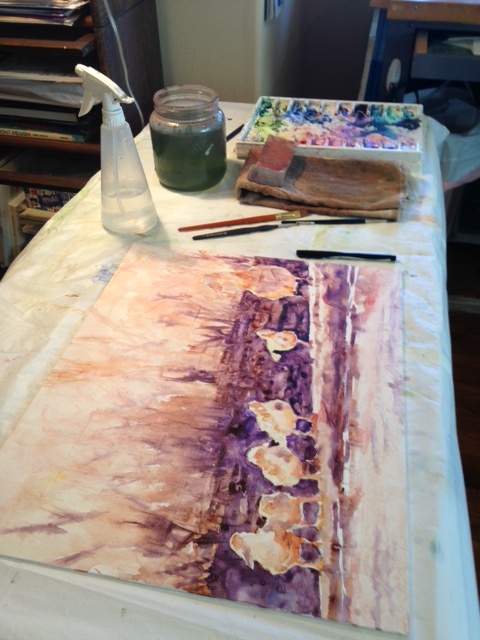 Early in the afternoon, I felt I had work still to do on the painting, but took it to the show anyway. It received much praise and commentary. There was plenty of discussion on the conversation of the ducklings and their mother. So funny! After looking at it all evening, I decided to leave well enough alone and announce it finished. This is one of my favorite paintings. 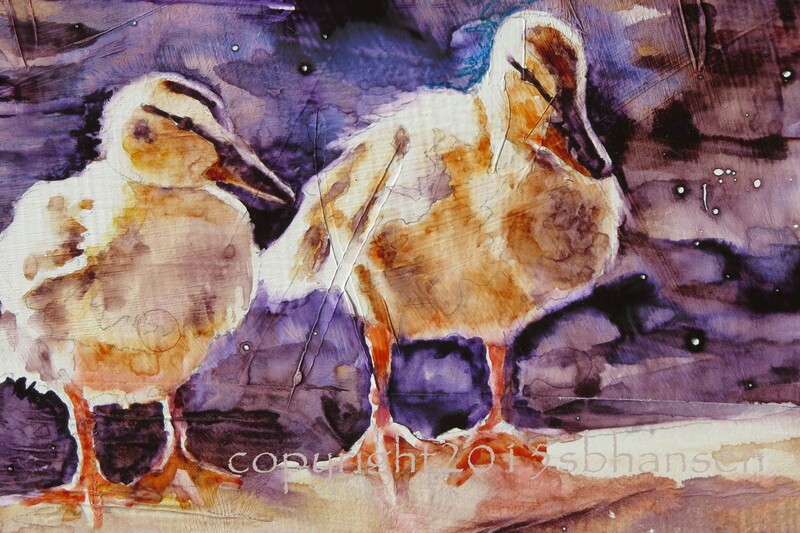 I love these little ducklings and feel it is a strong conversational piece. I’m happy with the suggestion of a background and the neutral color of the overall painting. Hope it puts a smile on your face as it did to the many people who saw it at the First Friday show.